Happy Onam Wishes To All who Celebrate this grand Festival. Actually i planned to share few Onam Sadya recipes but couldn't do it may be next year will try to share. 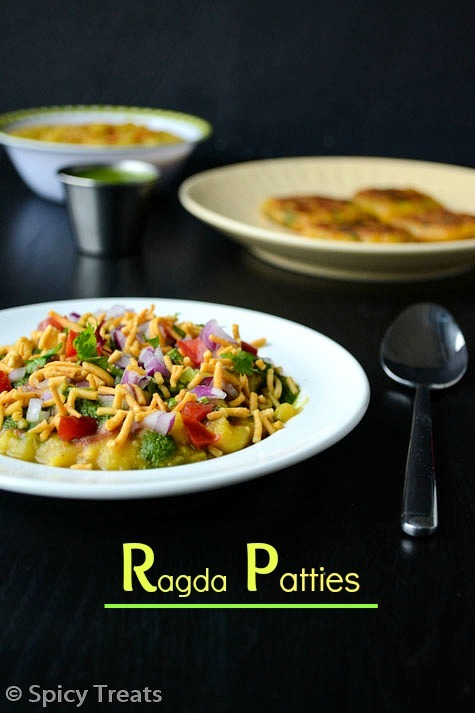 Now coming to today's recipe Ragda Patties / Ragda Pattice, Popular Indian chaat or one of the famous Mumbai's Street side food. But i have tasted this refreshing and yummy chaat in my hometown chaat shops. 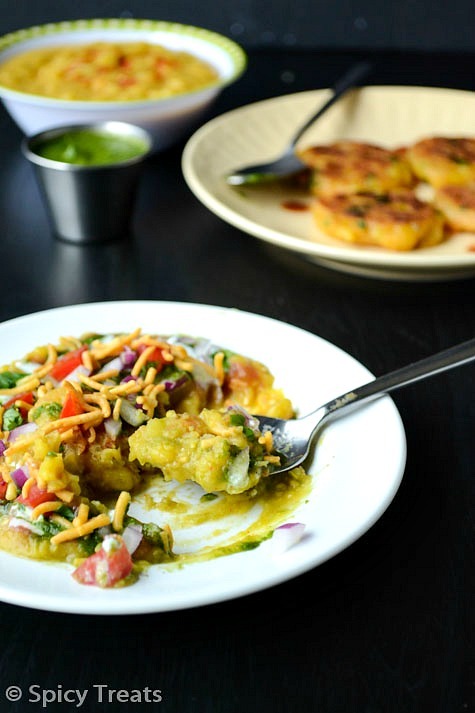 I still remember that shop which was near to my home in salem town area, they sell all kind of snacks/deep fried snacks, sweets, chaat recipes and I am a big fan of their Chaats - Ragda Pattice, Samosa Chaat, Cutlet Chaat, Pani Puir, Masala Puri, Kachoris, Dahi Puri & so on. A plate of this Ragda Pattice is just Rs.5 (13 yrs back) with so yummy taste and so many days this platter was my dinner meal. Really this is so filling, healthy and delicious snack/meal. 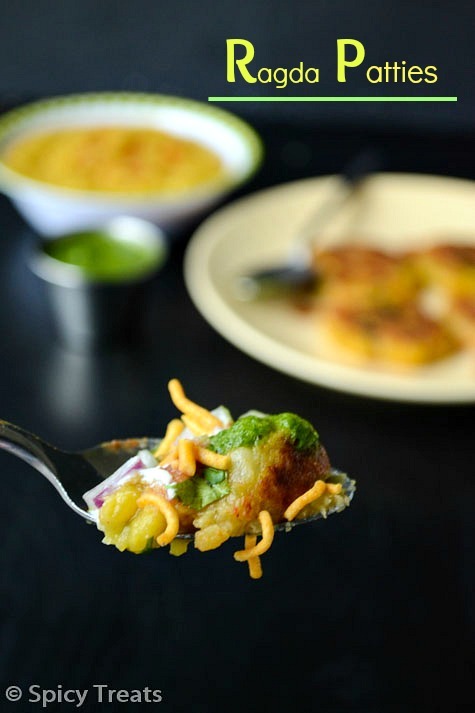 I usually make this Ragda Patties using the Peas chaat which i have already shared. But this time not in a mood to cook so checked for one easy breezy Ragda recipe and happy to find it in Dassana's space. 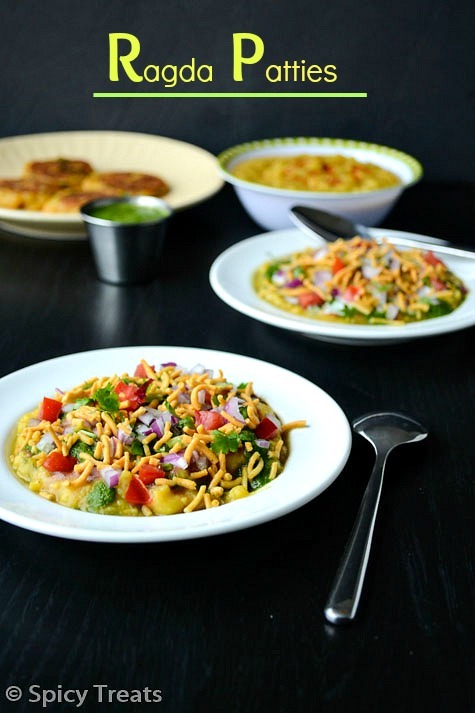 Without any second thought i tried it and it turned out so good and we loved this simple Ragda with Aloo Tikkis, paired so well. 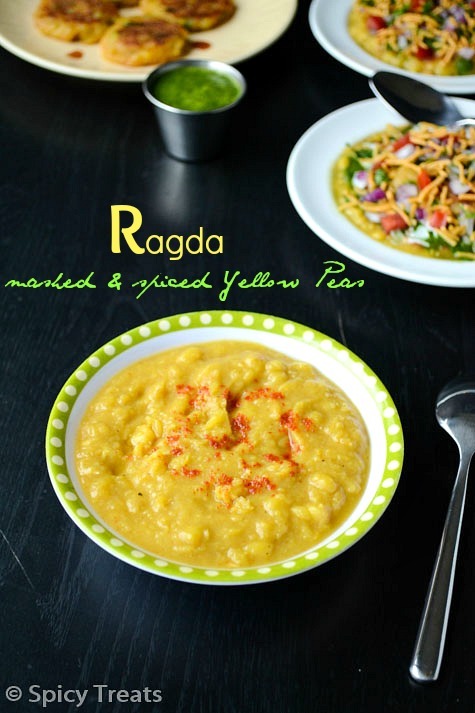 Thanks Dassana for this quick and yummy Ragda recipe. Wash and soak peas overnight or soak it around 6 am if you planned to make it for your evening snack. Then take it in a pressure cooker add water, turmeric powder and enough salt and cook it for 2 whistles. Once done wait till pressure cools down after that open the lid, switch on the stove add hing, chilli powder, cumin powder, amchur powder stir well and boil till it thickens slightly. That's it...Quick and delicious Ragda ready. 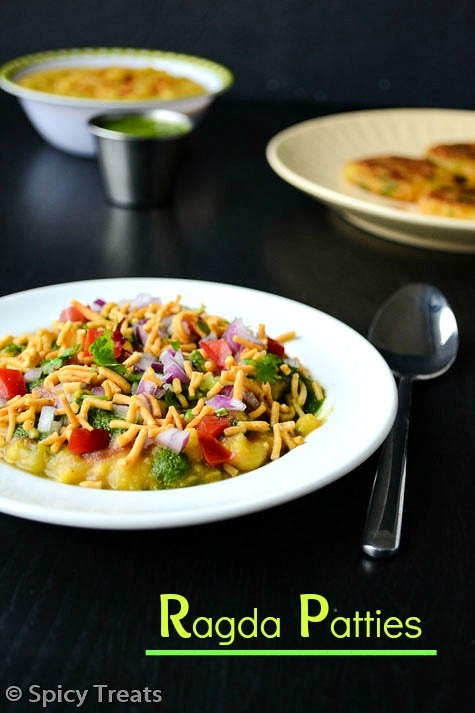 This can be served as a quick Ragda chaat or as a Puri filling. Wash potatoes thoroughly and boil it with enough water till soft. After that peel the skin and mash it slightly and take it in a bowl, to the mashed potato add cumin powder, chilli powder, salt and cilantro and mix well. Lastly add corn flour and mix thoroughly and divide it into big lemon sized balls. Now heat a tawa/griddle, smear with oil and arrange the shaped aloo tikkis ad cook in medium heat, after 2 minutes turn other side and cook for another 2 minutes or until turn golden brown and crisp. Once done remove from the tawa, that's it Yummy aloo Tikki ready. 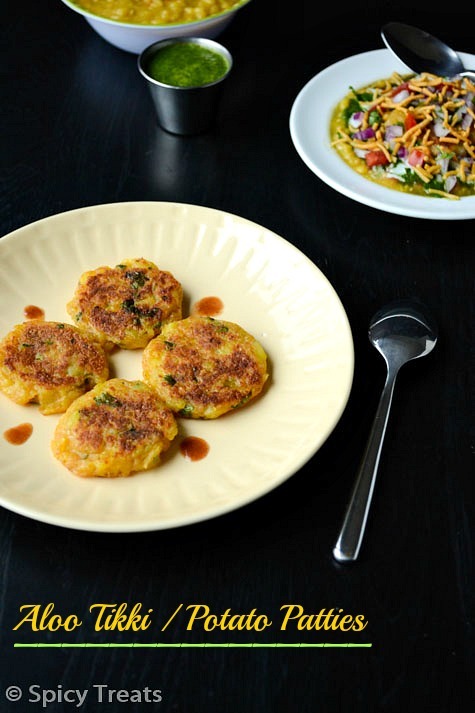 This aloo tikki can be served as a snack with Chaat Chutneys or with ketchup. 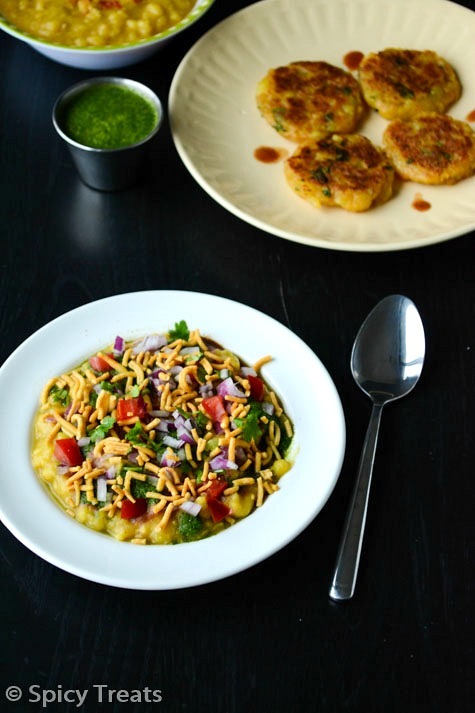 chaat chutneys, yogurt and add finely chopped onions, tomato and finally garnish with plain sev and cilantro. That's it...Yummy Ragda patties ready to relish. 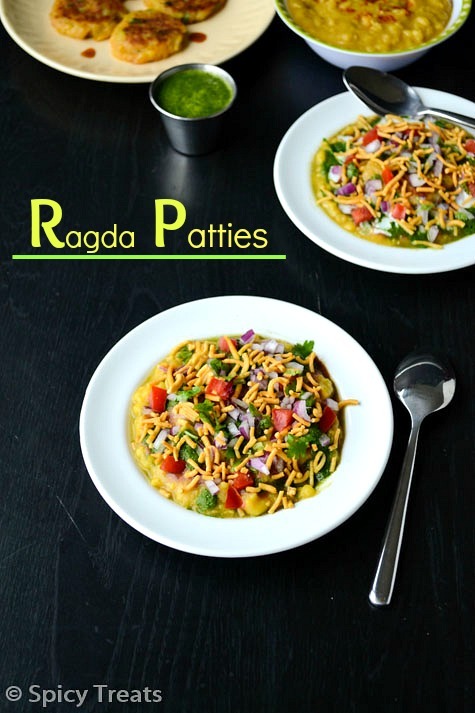 very very delicious looking ragda pattice :) looks simply yummy and so tempting me !! :) love all the captures !! Tempting again :). I am done with chaats for a while. Thx for linking. 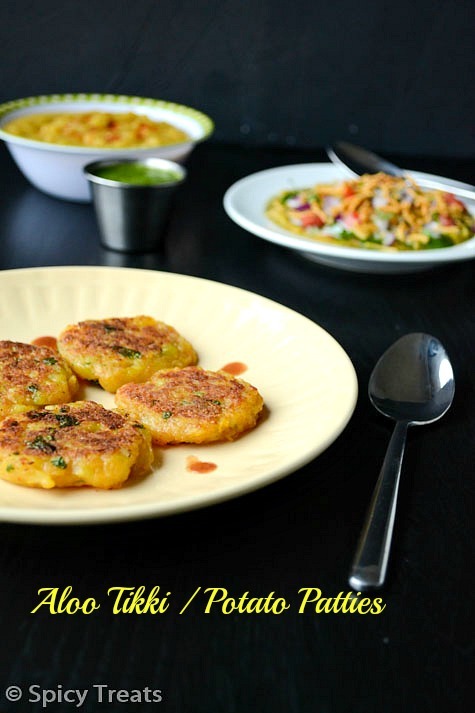 Delicious and lovely looking aloo tikkie snack. Wonderfully prepared. Wow.......so lovely lipsmacking good ragda pattice. yummy and droolworthy dish. Super like, my all time favourite chaat after pav bhaji..
thanks sangeetha for trying the recipe as well as linking back. nice to know you liked the ragda. feeling hungry looking at the pics. Thanks for the invite Shruti will definitely send in some entires soon..